For Part 1 of Maui (includes Lahaina, Turtle Town, Paia and Haleakala), check this post. Big beach & Little beach (Sunday) - Well first off, Big beach was the best beach I've seen in Maui - ahead of every other beach. Soft white sand, turquoise blue warm water and gentle waves - it was perfect for me in every way. Tired from the Haleakala hike of the previous day, I spent most of my time in Big beach sleeping under a tree :). Before sunset, I headed along to the Little beach with a group of other ladies from the hostel. Little beach is this tiny cove behind the Big beach and it is a clothing-optional beach. Every Sunday evening around sunset there is a party on the beach. The locals play drums, and it is a festive-like environment with a lot of dancing and fire-tricks after sunset. The way I see it, the atmosphere at little beach captures the feeling of being in Hawaii. It's a Zen like state! I strongly recommend everyone to visit the Little Beach. Iao Valley (Monday) - Iao Valley State Park is pretty famous in Maui, we headed there for a day-hike on Monday. This was the most green place I saw in Maui. There's a short walking trail (about half mile) as soon you enter the park. We completed this loop quickly, and the best thing here was the view of Iao Needle. Amidst the lush greenery, this 1200-foot tall rock easily stood-out. There's historical and cultural significance to this valley, with the Iao Needle serving as a lookout point for King Kamehameha during a war. Next, we started our hike for the day - which was an uphill hike for a view of the Valley. As we hiked along, I realized that the path was narrow (a lot of overgrown bushes on the trail route) and slippery (rains from the previous day). After walking a mile or so uphill in this fashion, I decided to come back down because I wasn't enjoying the trail anymore. I didn't have the proper footwear to hike in this path, nor was I bold enough to walk bare-foot. Another person from the group also came downhill with me and we hitch-hiked back to the hostel. I spent the rest of the day lazing around in the hostel. I don't regret not being able to complete the hike. Iao Valley was good, but definietly not the best that Maui has to offer. Note: Iao Valley is actually closed right now because of damages from floods, but it is expected to open again in July 2017. Road to Hana (Tuesday) - This was my last day tour in Maui, and definitely one of the best days of the trip. We started the day early at 8.30 am. First stop was at Aunty Sandy's store selling banana bread in Ke'Anae Peninsula. This store was close to coastline near Nuaailua Bay. The banana bread made with local bananas tasted yummy and the view was scenic. The black rocky shoreline formed by hardened lava provides a perfect contrast to azure colored ocean next to it. Next stop was at the underwater caves. These caves are located close to the Wai’anapanapa State Park. These caves were once open for swimming. Unfortunately, they are now closed as some of the caves have collapsed and it was determined that they aren't safe anymore. Some members of our group went in for a quick dip. Next, we went to a black-sand beach in Wai’anapanapa State Park. This beach was good, but I have seen better black sand beaches in Big Island at Hilo and Waipio Valley. The waves were rough, so it was not a good beach for snorkeling and water-related activities. We didn't spend a lot of time here. Our next stop was at a red-sand beach with turquoise water. This was the first highlight of the day for me as I had never seen a red-sand beach before. The red sand comes from the red rock hills surrounding the beach. The beach is more of a cove between a couple of hills, but there's no denying that it was gorgeous. The warm turquoise colored ocean water made it even prettier and because it was a cove, the water was very gentle. There weren't a lot of people when we went - so our group pretty much had the entire cove to ourselves. We had a great time. There is also a diving spot on the hill surrounding the cove, if you are interested in that. Next we drove through the seven sacred pools. We didn't make a stop here as the waterfalls were in swell because of the rains and therefore not safe. But I did manage to get some good glimpses of these waterfalls on the drive and they looked quite pretty! According to Maui Guide Book, these pools are closed indefinitely. Our last stop of the day was Waimoku falls and Pipiwai Trail hike. This three mile hike was easily the best thing of the day! Just a few minutes into the trail, you'll get a view of the first waterfalls - the Makahiku falls. Located in the midst of a lush green forest, these single drop falls look good. Unfortunately, you only get to see Makahiku falls from very far. 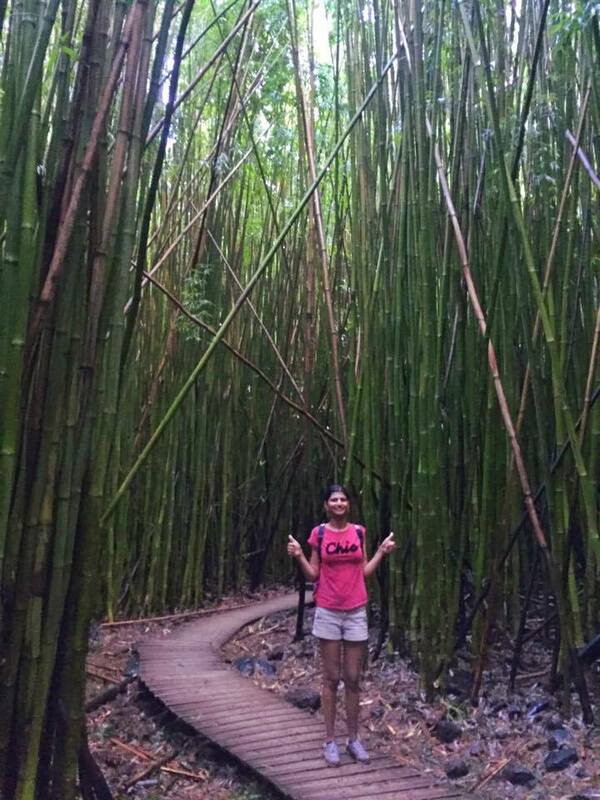 Further along in the trail is the bamboo forest, where you'll feel small walking in between super-tall bamboo shoots. I've walked through many trails, but never in between a bamboo forest - so this was pretty unique and beautiful. And lastly, at the end of the trail, are the beautiful Waimoku falls. I was spell-bound seeing the Waimoku falls. The falls end at a pool close to where the hiking trail ends, so you end up very close to the base of the falls. You have to crane your neck to see the top of these falls (and with a drop of 400 ft, they are the tallest falls in Maui). I got lucky, Waimoku falls has way more water than usual when I saw them because of the rains (it was raining when we were hiking on this trail, and the rain stopped just as we reached the end of the trail). Even if there was lesser water-flow, I'd still recommend this trail as one of the best things to do in Maui. Daily hostel tours may get cancelled impromptu because of the weather conditions. Be prepared and have back-up plans. You can rent a car and drive around or find someone else in the hostel you can team up with. You can also take a bus, hitch-hike to a beach - there are a lot of options. The name-list (to enter your name for the hostel tour) for next day's tour opens only after today's tour has left. This means that spots on the van for daily tours may get filled up and you might not have a spot left. Mostly, this only happens for full day tours like Haleakala or Hana. Try to have someone in the hostel write your name down, or team up with someone who can give you a ride. Pancake flour, butter and maple syrup are available in the hostel kitchen. You need to make your own pancakes - and yes they're pretty easy to make. Coffee with creamer & sugar is available too - so if you're a coffee person they have you covered. Mornings in the hostel can be pretty busy somedays, but you can also laze around and talk to people. You can buy groceries and cook your own food in the hostel kitchen. I cooked dinner for myself more than a few times. The daily tours include a stop at Safeway or Foodland - so you can pick your own groceries there. A couple of times during my stay - a few of us got together and ordered pizza. So that's an option as well. If you cannot cook, there are a few restaurants close-by that you can grab dinner from. There is a party in the hostel every Friday night with free beer. It's a crazy night filled with drinking & dancing & beer pong & everything else you can never think of. My point is, you'll have a lot of fun. There was a "no clothes" party on the Friday that I was there. This meant people had to wear something that wasn't made from a cloth. A lot of people came up with very interesting ways to dress themselves, so it was definitely memorable :). Almost every night in the hostel is fun - there's music, pool and lots of people that you can socialize with. Good time to meet new people and make new friends. I met people from all across the world - Germany, Switzerland, Australia, Canada, Israel, Argentina & New Zealand - to name a few. If meeting people is not your thing, you can stick to your room and go to sleep or read a book - it's fine. There are no rules. Travel light, you can get your laundry done in the hostel. Don't forget to carry essentials like sunscreen, swim wear & beach towel. Take good hiking shoes as well, the hikes are worth it.